Connectivity from East to West has been a huge priority for you in Lucky District 7. Exciting projects are on the way to connect neighborhoods to parks, the river, the Levitt Pavilion, and light rail. This just completed $12 million project has improved mobility for all modes and lays the groundwork for further improvements to the I-25 and Broadway interchange. Learn more here. This project will remove the stairs to create a bikeable and ADA accessible grade-separated path underneath the rail tracks. This also includes improved crossings at Santa Fe and an additional 10 feet of sidewalk along Santa Fe from Jewell to Florida. Design in 2017-18, construction in 2019. Learn more on page 62 of the 2013-2018 CIP 6 Year Plan. This bike/ped bridge will provide a critical connection across Santa Fe and the rail lines at Jewell. 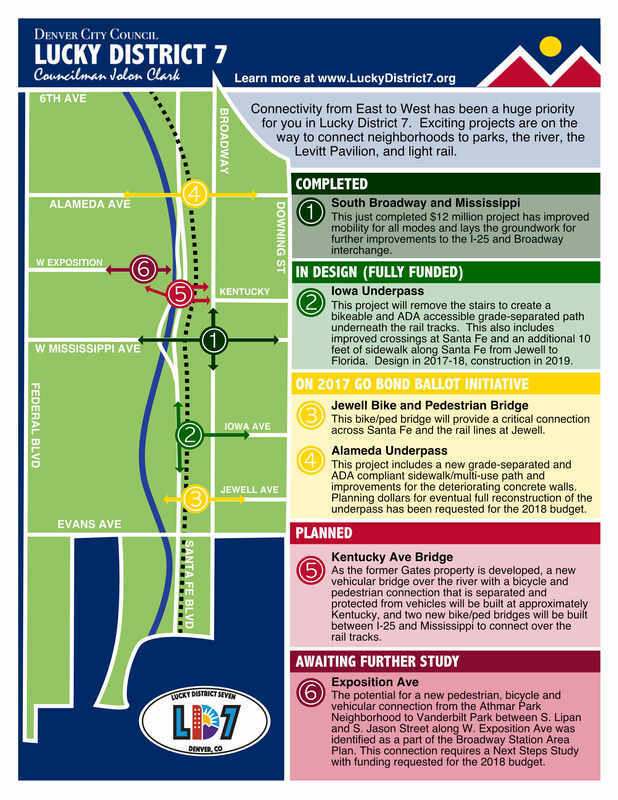 Learn more about this and other GO Bond projects here. This project includes a new grade-separated and ADA compliant sidewalk/multi-use path and improvements for the deteriorating concrete walls. Planning dollars for eventual full reconstruction of the underpass has been requested for the 2018 budget. Learn more about this and other GO Bond projects here. As the former Gates property is developed, a new vehicular bridge over the river with a bicycle and pedestrian connection that is separated and protected from vehicles will be built at approximately Kentucky, and two new bike/ped bridges will be built between I-25 and Mississippi to connect over the rail tracks. Learn more here. The potential for a new pedestrian, bicycle and vehicular connection from the Athmar Park Neighborhood to Vanderbilt Park between S. Lipan and S. Jason Street along W. Exposition Ave was identified as a part of the Broadway Station Area Plan. This connection requires a Next Steps Study with funding requested for the 2018 budget. Learn more here.